As a successful project manager, you’re most likely a multi-tasker who is generally pretty good at juggling many balls, or tasks, at once. Before starting any project, you’d agree that you need to have a firm grasp of the task at hand, knowing what the end user needs from you. However important that first step is, that’s only the beginning. You have to then conceptualize the steps, create a plan, foreseeing the need for a Plan B, C or D – just in case. Next you’re on to specifying a project duration, and then, upon commencing, keeping all the resources, including team members, finances, etc., moving along in a nice and tidy fashion all while maintaining an overall sense of professional decorum. No sweat, right?! Enter project management planning and the tools and concepts that will help you be up to the challenge. Taking the right steps in the most efficient order assists your team in delivering the best possible outcome in the estimated amount of time. At the outset of the project, you must determine which tasks are stand alone and can be worked on separately, and which assignments depend on another step having already been accomplished and so forth. You know that the individual aspects of any project are somehow interconnected. Figuring out the “how” that works best for your specific project will help you and your team start, stay and productively stop on the same page. These task relationships are called dependencies. The connections between tasks and the priority of the task associations determine the project’s scope and time frame. Any issues that occur in the task network that could delay milestones and deadlines have the potential to alter the original scope and agreed upon completion date. A way to stay on track, should this happen, is to add a task(s) that depicts the new scope, making sure to reflect new time and resource needs. search for ways to compress the schedule and save money along the way if possible. Even new project managers have likely already encountered the concept of dependencies. For instance, if you have ever wanted to enroll in a college course there may have been a prerequisite course. Meaning one class needs to be completed before taking another for which it is a prerequisite. To be clear, a prerequisite refers to something that must happen before something else can occur; hence, in this scenario, creating a dependent relationship from one class to the prior class. Back to project management, mapping out all of the assignments, seeing how tasks start/stop/overlap and understanding dependencies is crucial to staying within your project’s parameters. Let’s look at 4 types of task dependencies to consider as you conceptualize and execute any plan for a new project. Finish-to-Start – This approach is the one with which most people are familiar. Step 1 of the project must be totally completed before Step 2 can begin: making Step 2 dependent on the completion of Step 1. Keeping an eye on each team member’s progress in this type of dependency is critical for keeping the entire project on target. Start-to-Start – In this dependency, there will be a Step 1 that must already be under way, however, it does not have to be completed in order for Step 2 to begin. They may occur simultaneously, as long as Step 1 started first. A benefit of this dependency type is that work overlaps, moving the project along more quickly. Finish-to-Finish –You may have a situation in which one step can’t stop before another step does. While there may not be any specific time frame for the endings, with simultaneous tasks in motion, the completion of these tasks must take place at the same time. Start-to-Finish –This approach dictates that Step 2 can’t finish until Step 1 starts. The Start-to-Finish approach is the most complex and would be used infrequently. Here’s a chart that will help you to visualize these dependencies. Also, you can check out this video that walks you through and helps you understand each type of dependency on the list. The presenter uses several different scenarios as examples while showing not only how to understand each dependency, but also how to include lags that may occur along the way. In the big picture, a lag is an interruption in the progression of a project. Smaller picture, it’s a delay in the completion of a task which affect other tasks. These disturbances can add time to either or both of the task’s start or finish date – effecting activity of either its predecessor or successor. Task dependencies can occur both in the same project between tasks as well as between tasks from different projects. In either case, predecessor/successor dependencies are created. For example, it may be that your project is considered “Step 2”, so you’ll be waiting on the team to complete Step 1. Your dependencies may also be related to the available company resources and/or the priority your leadership places on your project. Earlier, I mentioned that there were tools that can help you plan your project. Keep in mind that there’re numerous software possibilities that may assist with project planning, however, they’re not all are created equally. Many will provide a customizable, easy-to-use interface, timeline view, reports and social media capability with email integration, mobile connectivity and more. However, not every alternative out there includes a dependency function. While not an exhaustive list, here are a some that allow for dependencies in addition to other organizational and time management aspects. 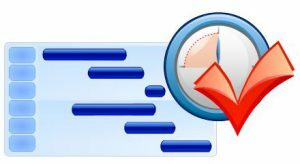 For a more in depth look at these top PM software tools, check out this article, Top 5 PM Software with Dynamic Gantt Charts. Now that you have knowledge of task dependencies and which software helps you manage the dependencies, your ready to get started. Now go analyse, visualize and execute! Thanks for this article it’s very informative.